A quick and sparkly card today…all those little dots on the feathers are gold embossing…wished they showed up better in my photo. 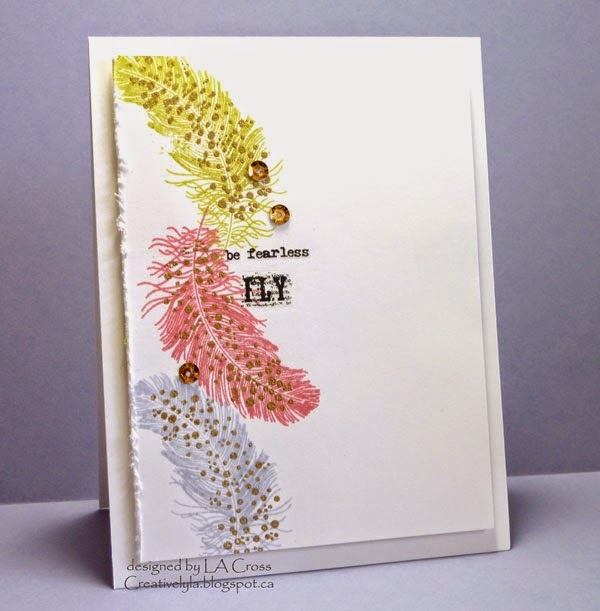 Stamped the feathers in three colors, added the gold embossing and for something a little different…a rub-on sentiment from Tim Holtz. A smattering of gold sequins, some distressing and done! The feathers have it! They are wonderful and the gold embossed dots are perfect. How did you do the dots? They are awesome. Is it a stamp? Anyway I am in love with the feathers!